enhance quality services for individuals with disabilities. Introduce yourself to new customers, reinforce your services to existing customers, unveil new products or services. As a Conference Exhibitor on March 16, you have the unique opportunity to connect face-to-face with conference attendees to demonstrate and educate the benefits or your products and/or services that will enhance the way services for individuals with disabilities are delivered, designed, and planned. 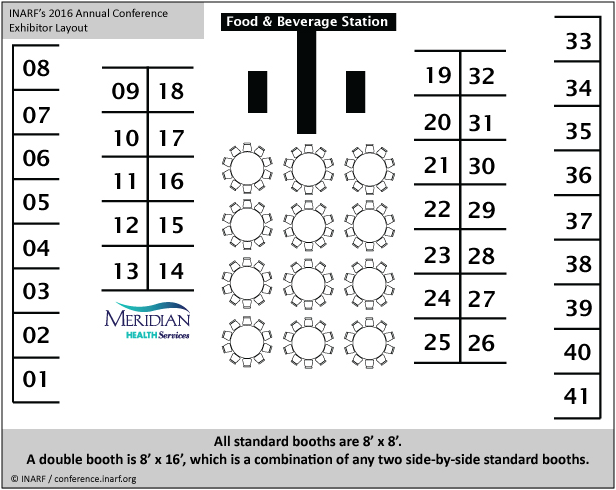 Exhibit opportunities are designed at a variety of levels offering organizations maximum visibility before, during and after the annual conference. The corresponding benefits of each Exhibit option are listed below in order to guide your decision in the optimal exposure for your organization. Exposure on the INARF Annual Conference Webpage and Marketing Materials. As a Conference Exhibitor, your organization’s name is included in the Exhibitor listing located on the INARF website and ON-LINE publications recognizing your participation in and support of the annual conference. Dedicated Agenda Time. During dedicated breaks and meal functions, attendees are encouraged to stop by the exhibit booths to gather additional information on the products and/or services of interest to them. The exhibit layout encourages high traffic in a casual atmosphere to speak with potential customers. Breakfast, lunch and refreshment breaks are complimentary for exhibitors. NEW! Conference Attendee Mail List. Each Exhibitor receives a pre-show attendee list of the registered 2016 conference attendees 3 weeks prior to the event. Complimentary Conference Registration. Registered exhibitors may attend any of the educational sessions that highlight new trends and innovations in the human service industry, as well as any other special event at the conference on the day of exhibition. One-day registrations are available to attend on non-exhibit days of interest. Discounted Room Rate. Exhibitors are able to take advantage of the negotiated group rate at the conference hotel. 31. ​Comer, Nowling and Associates, P.C. This opportunity provides exhibit square footage strategically placed among other exhibits within the Exhibit Hall. This opportunity is two standard exhibit booths, providing the largest exhibit square footage strategically placed among other exhibits within the Exhibit Hall (as available). INARF will include one (1) quarter page advertisement in the conference program. INARF will include your organization’s listing on the conference sponsor/exhibit webpage with a link to your website. The conference hotel will provide wired internet access to your exhibit booth. The conference hotel will provide electrical service to your exhibit booth to run lights, displays, etc.